To choose one of them, click on the “Pages” in the WordPress admin panel, and then on the “Add New” button. You will see the Amelia insert shortcode button in the editor. After you click on it, the Amelia booking widget will open and you will be able to select the view. Click “OK“, and “Publish” your page. Please note: If you cannot find the shortcode button you can use [ameliasearch] shortcode, and if you want to use the current date filter you can use [ameliasearch today=1] shortcode. Just put the shortcode on the page and “Publish” it. 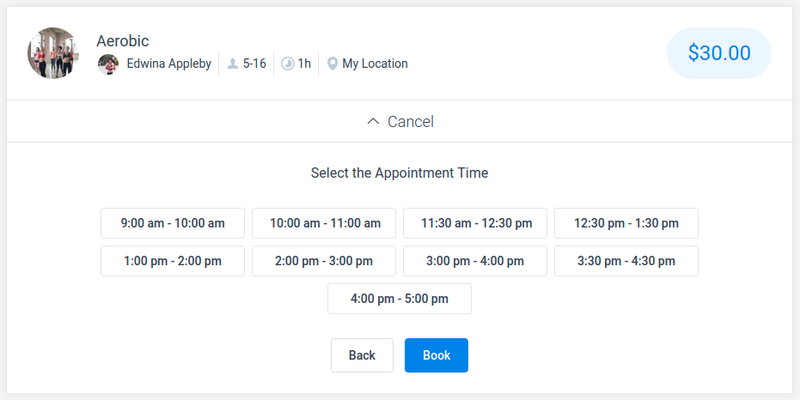 You can use the “Front-end Booking Search” view when you want to give your customers the possibility to search for appointment by selecting several filters so that they could find the best time slots and services for their needs. Date – This filter is required and other filters cannot be used until the date is selected. Time Range – This gives the option to select a time range preferred for the appointment. Services – This gives the option to select one or more services for which customers want to see in available appointments. Location – Gives the option to select a desired location. Employee – Offers customers to select the employee. Your customers can select as many filters they need, just remember that it is required to select a date first. By default, the page will be empty until some filter is selected. If you don’t want that, you can check the option “Preselect Current Date” in the Amelia shortcode builder after you choose the Search view. In that way, your Search page will always show available appointments for the current day. After they select the date, they will immediately see the initial results, and by choosing any other additional filter these results will be narrowed down in real-time. After they are done filtering, they can search on the list for a specific appointment by their name, and sort those results by “Ascending” and “Descending” name, and “Ascending” and “Descending” price. 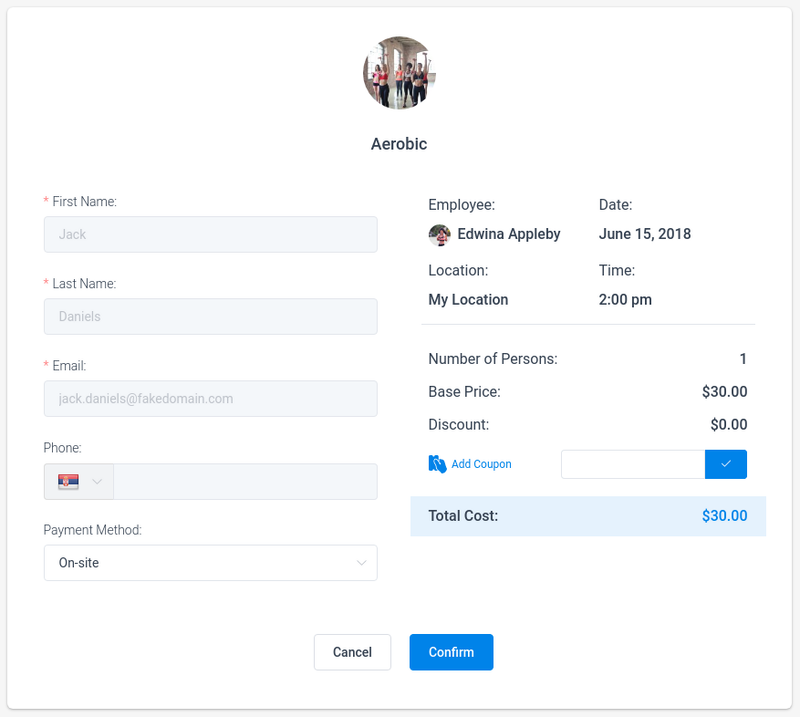 “Bringing anyone with you?” – If the service allows group appointments, your customers will see this option with a drop-down to select the number of persons. 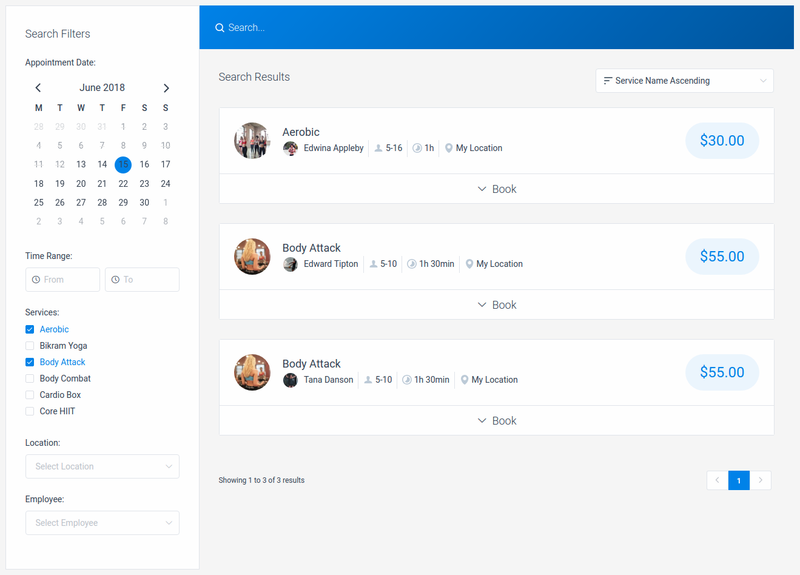 Capacity for a group appointment can be defined on the back-end of your service dialog and separately for every employee. “Select the Extra” – If the service has extras, your customers will see this option with a checkbox beside each one and once they check extra the quantity option will enable them to choose how many extras they want. Once they choose these two and click “Next” they will see available time slots for the appointment. Also note that if your service doesn’t have the possibility for a group appointment and doesn’t have extras, after clicking on the “Book” button they will see time slots right away. A section with customer’s information – On the left side customers will be required to enter their first and last name, and email, while entering a phone number is optional. Customers will also be able to choose between different Payment Methods, depending on the chosen ones in the Payment Setting on the back-end of the plugin. A section with appointment information – Customers will see which employee, date and time they have chosen. If they’ve made a mistake, they can go back on the “Cancel” button before confirming the booking. A section with pricing calculation – Customers will see the price of the appointment, the price of a chosen extra, and the total cost that will depend on the number of persons in the booking. The total cost can be decreased using a coupon you’ve configured on the Finance page of your back-end. 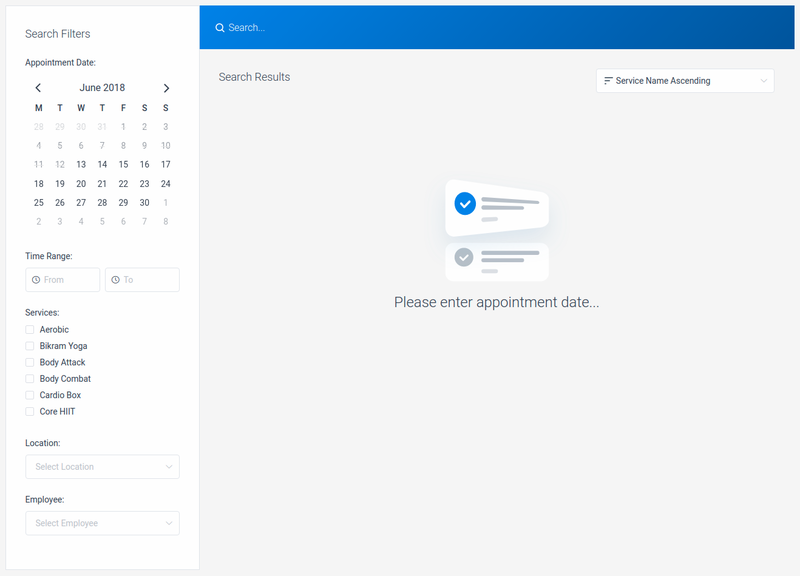 After they click “Confirm”, they have an option to add this appointment to their calendar if they wish, but they can also close the window, as booking is already finished at this point. Note that if you enable the “PayPal” payment method before adding the appointment to calendar your customers will be redirected to PayPal to log in and confirm the payment.